The Atlantic Ocean gets all of the attention when it comes to beach erosion and the loss of shoreline, but as many soundside property owners have discovered the western side of the Outer Banks can be ever bit as dynamic as the ocean side. In many ways the loss of shoreline on the sound is more complex—and certainly more subtle —than what is happening on local beaches. 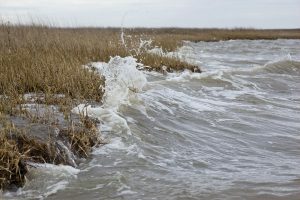 Although waves on the sounds are not nearly as large or powerful as ocean waves, there are waves—almost always generated by wind—and those waves are what drive the loss of shoreline. In an undisturbed environment subaquatic vegetation (SAV), shoreline vegetation, marsh and wetlands protect the shoreline. When we build in those areas, we disturb all of those natural lines of protection. There are a number of steps that can be take to mitigate the effects of loss of those natural barriers and to protect property. Bulkheads are probably the most popular way to protect property from erosion on the soundside. A bulkhead is a vertical wall perpendicular to the surface of the water that deflects wave energy. Riprap are stones placed along the shoreline designed to deflect and dissipate wave energy. A revetment is a slanting vertical wall placed along the shoreline. Revetments and riprap are often used together. Living shorelines are designed to regenerate the subaquatic vegetation of the shoreline and allow the natural shoreline protection to reestablish itself. Unlike hardened structure shoreline protection, a living shoreline dissipates rather than deflects wave energy. That requirement very neatly sums up the concerns about bulkheads and hardened shoreline protection structures in general. Initially they work very well. Over time, however, they can create significant shoreline erosion in areas adjacent. When a wave strikes a bulkhead, the energy is deflected, but it does not go away. The energy either goes left, right or down. If the energy goes to the left or right the neighbor’s property may be affected. If the energy goes down, over time, either the bulkhead will fail or the shoreline behind it will erode. Advantages: Very commonly used, with a number of companies specializing in bulkhead construction. Permitting process is straightforward. Relatively inexpensive compared to other shoreline protection methods. Disadvantage: Potential damage to adjacent properties or to to the property owner’s shoreline depending on where and how wave energy is deflected. Because they are hardened structures, riprap and revetments can create many of the same problems seen with bulkheads. However, riprap especially, can dissipate some of the wave energy as it strikes the shore, although erosion at the ends of riprap can still be a problem. Riprap and revetments, particularly when used together usually cover more than one property and in some cases can be an effective mitigation tool. Extended riprap is often used to protect roads. Advantages: Dissipates wave energy in the protected area, so it will be more effective than a bulkhead over time. Disadvantages: Can be very expensive, especially on the Outer Banks where there is no rock suitable for riprap. There is a risk of erosion on the ends of the protected area. A relatively recent addition to shoreline protection, a living shoreline works to recreate the original SAV, shoreline vegetation and biodiversity of the area that is being protected. Living shorelines have consistently been shown to be the most effective means of shoreline protection over an extended period of time. In the area that is being protected, underwater sills are installed. There a number of designs and materials that can be used, but the purpose of the sills is the same in all cases—to dissipate wave energy as it approaches the shore. The nearshore waters of estuarine shorelines are usually fairly calm, and the sills recreate that environment allowing the natural cycle of the system to reestablish itself. Advantages: Significantly more effective than any other shoreline protection method. 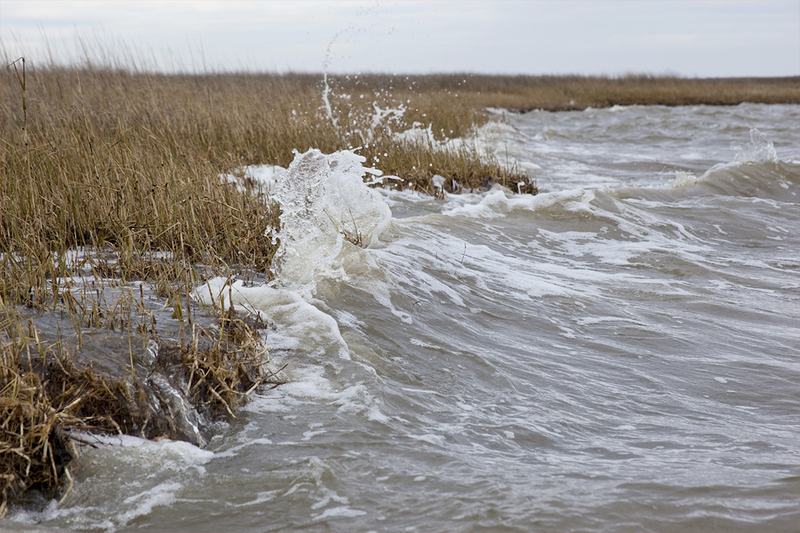 Has been shown to recreate or rejuvenate damaged estuarine systems. Disadvantages: Expensive and rarely used for individual properties. A living shoreline requires a major CAMA permit, a time consuming process requiring the expertise of a coastal engineer and other experts. Although over time it is more effective than any other shoreline protection technique, bulkheads, riprap and revetments will give immediate protection. There have been a number of relatively small living shoreline projects on the Outer Banks. There are currently two large projects—Kitty Hawk Bay at Moor Shore Road and the north end of the Coastal Studies Institute marsh—that are in the permitting process. Both projects will be among the largest undertaken in North Carolina.